Potash has been dropping for four years now. Is this a normal commodity cycle, where prices stay low enough that new investment is discouraged and marginal players are squeezed out? If so, where are we now? Potash is a fertiliser which provides crops with potassium - one of the three primary nutrients for plants. It accounts for 70 to 90% of potassium fertiliser used, and is commonly used for bulk crops or grains (1). There is no commercially feasible substitute, although some are working on it (1, 2). Annual demand is around 55-65 million tons. Ignore short term demand since its unpredictable. Just assume long term demand growth of 2%, and concentrate on looking at supply instead. 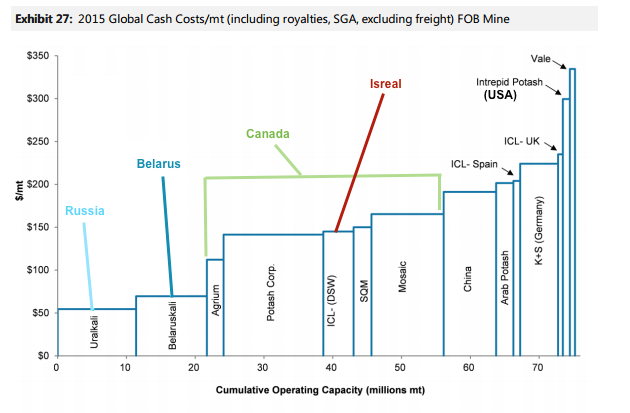 The above excludes transport costs, which are significant for a bulk commodity like Potash. Estimated CAD 45 per ton from Saskatchewan to Vancouver on the Pacific coast. Around 2000km by rail. Or an estimated USD 50 to 100 per ton to transport from Saskatchewan to the US. 80% of Uralkali's exports are shipped through St. Petersburg. Total transport cost (rail and freight) for this was USD 28 per tonne in 2015 (p29). Most of the remaining potash was transported to China by rail, which cost USD 39 per ton. Belaruskali gives no transport costs, but they must be lower since Belarus is so much closer to the sea that Uralkali's Perm region mines. Supply is quite easy to predict. Since potash mines are massive projects that take 5-7 years and $1-2 bn to complete, most companies' expansion plans are well known. Most projects go belly up, especially those from small companies. I get 11 mt/pa to be added by 2021. 8.5mt if you exclude Yancoal, for which the project has not started development yet. That is assuming mines operate at 90% of capacity. Also excluding any additional capacity from Potash Corp (POT). Assume they won't increase production even if they have capacity, as they continue to act as the swing producer in a low priced environment. 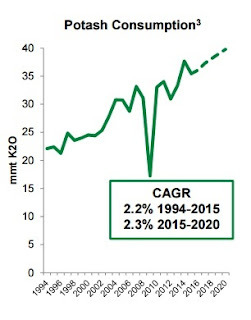 Even taking the lowest figure of 8.5 mt net extra capacity by 2020, with the conservative assumptions above - with long term growth of 2%, it will take 5.5 years (from now) to absorb the extra supply. That seems balanced. We are not at a place where we can say that Potash prices will rise due to constrained supply in the future. We're at a place where we can say they may stop going down. Another thing to watch for are potential African projects. Ethiopia (Dankalli) seems dead, with ICL pulling out due to lack of infrastructure. But Republic of Congo and Gabon look interesting - very low production costs, no rail required, and easy shipping to Brazil. Still too early to tell if they produce, but if they do hit their numbers, they'll be the cheapest producers in the world. I judge the likelihood of new capacity plans to be actually built based on the track record of the company, their financial backing, and the cash costs of the project. 2.2mt by 2020, assuming operating at 90%capacity. 2mt. Production scheduled to start from 2021 to 2023. Mine under design in 2015. This company seems very profitable, but this is their first potash mine. 1.8 mt if operating at 90% capacity. Same as Uralkali - in Prem region. Usolskiy mine expected startup in 4Q 2017. Volgakaliy expected mid 2018 startup. Both projects have 8.3mt KCl production potential. 4.2 mt nameplate capacity around 2020. So 3.8mt if operating at 90% capacity. Est 10.3mt production in 2015, plans to increase supply to 12.5mt by start of 2020. That includes Petrikovskoye, which will add 1.5mt KCl. Little information available about this company. 1 mt if operating at 90% capacity. Produced 2.2m in 2016, which is 73% of nameplate capacity of 3mt (p8). Expect to ramp up in 2017 . 0.5 mt, if operating at 90% capacity. Legacy: started producing in May 2017, expect to reach 2m production by end 2017. Plan to sell 0.7mt to US, the remainder offshore. K+S estimated to currently produce 6mt in Germany. High cost operations. 9.3mt production in 2016. They closed high cost mine (New Brunswick) but opened a cheaper one (Rocanville). Total planned expansion is 10.1mt. Morgan Stanley estimates 2015 had 9.3mt operating capacity, with 5.5mt capable of restarting in 12 months. They model 13.4mt capacity increase by 2020. Not all their capacity is used; POT acts as the swing producer. Additional 10mt capacity, but may not be used if process remain low. Part of Yanzhou Coal (HK:1171), which has been profitable for the last 5 years (p10) , but with high debt (40X 2016 income, p11). Are Chinese companies operating from a strategic rather than economic perspective? ie: acquire resources, don't expect profits. Economics should be the same as any Ssachkatchewan project. 2.5 mt if operating at 90% capacity. Cease UK production of 1mt/pa in 2018, produce SOP instead. 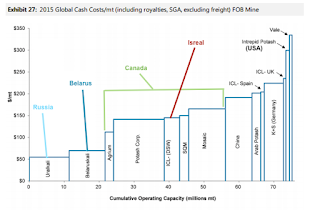 High-cost US miner. May go out of business. I’ll be conservative, and assume they do. Additional 2.8mt from panned Polovodovo mine. Costs 1.6bn, they may not have the money. Jansen. 8mt pa production, (10m nameplate capacity). BHP committed 3.8bn, estimates total cost is 14bn. I don’t think it will ever produce. 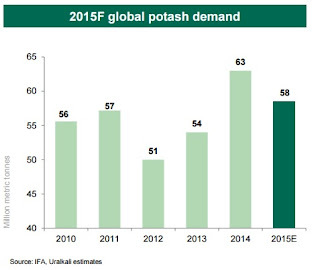 Need potash price of over USD 400 to be profitable, says POT. York project, under a national Park. Nameplate capacity 20mt/pa. Currently under design and site preparation. May be a different product. Polyhite is probably more useful for producing SOP It has 4 plant nutrients, so may be better sold as as blended fertilizer that has no Cl. Has less potassium than SOP. LSE listed. Stock price up to ~1.4bn pounds market cap. Gina Rinehart has a stake. Probably not relevant, supplying a different market. 2.8mt capacity in Saskatchewan. They bought native rights. Encato has a market cap of ~50m. ICL quit the project in Oct 2016. USD 38/t operating costs. But 500km rail/truck to Dijoubit. Produce SOP not MOP, not relevant here. Kola project. DFS to end in 2018. Expected start of production 2022. DFS to focus on 2mt. Very Cheap: Life-of-Mine cost $68/ton. 2 projects, no estimate for production capacity. Lac Dinga: In Republic of Congo. No estimate provided for production capacity. 1.6mt production for 2 Spanish projects. Plus 1m for another project. Any specific reason for Highfield 'Muga Project' being in the 'unlikely' basket? Project has completed feasibility, highly credible financial backers and apparently only stuck in Spanish permitting. No specific reason, just the usual doubts about a small company and new project. Yes, it has very low capex for 1mt/pa production. Any guess what is their production costs (per ton at mine site) and transport costs (trucking to port)? Is a Volatility Tsunami Imminent? Will A Barrage Of Tech Unicorn IPOs Mark The Top?